Red blood cells trapped by fibrin. 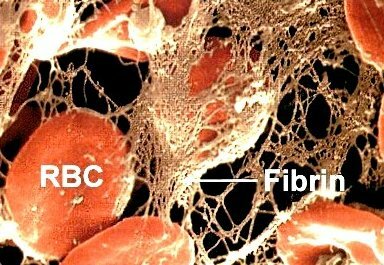 Fibrin is an insoluble, fibrous protein that is essential to blood clotting. Developed in the blood from a soluble protein, fibrinogen, fibrin is laid down at the site of a wound in the form of a mesh, which then dries and hardens so that the bleeding stops. In addition to the coagulation system, blood contains a fibrinolytic (fibrin break-down) system, the end-product of which is an enzyme called plasmin, formed from a precursor called plasminogen. Plasmin acts directly to break down fibrin filaments and dissolve clots in a process by fibrinolysis. The fibrinolytic system is activated in parallel with the coagulation system when a blood vessel is damaged. It helps restrain clot formation in blood vessels (thus helping to prevent clots from blocking blood vessels) and eventually dissolves a clot once a broken blood vessel has healed. Thrombosis (abnormal clot formation) only occurs if there is a disturbance in the balance between mechanisms that promote clot formation, such as sluggish blood flow, and those, such as fibrinolysis, that restrain clot formation or dissolve blood clots.